Maria Montessori believed that education began at birth and that the first few years of life are the most important both physically and mentally. The learning method a child is exposed to during their early years largely determines the kind of adult they will become. She compared young children’s minds to sponges, continually absorbing information from the environment and called this the “absorbent mind”. This is particularly evident from the way a young child learns to talk, without any formal instruction or conscious effort. Children delight in this method of learning and retain this ability until they are almost seven; in fact 80% of a child’s mental development takes place during their first seven years. Maria Montessori worked with children for over sixty years and proved her theory that children can learn to read, write and calculate in the same way as they learn to talk, if they are provided with the right environment. Children are intrinsically motivated, and they will succeed when their learning activities incorporate movement and opportunities for independence. Children will become self-disciplined when they are empowered to choose learning activities designed for specific developmental and learning needs. Each classroom is a respectful community of mix-age learners. Classrooms and other school spaces are learning environments prepared with the curriculum in mind. Teachers are trained in the Montessori Method. Parents understand and support the purpose of the school; they are partners. 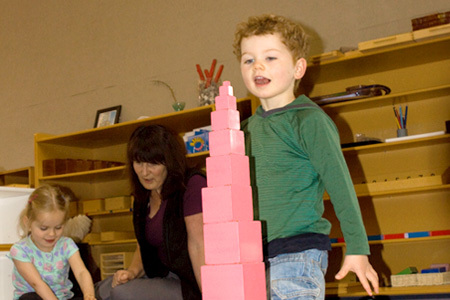 The Montessori approach is concerned foremost with the development of human potential. This approach is based on ‘following the child’, on recognising the developmental needs and characteristics of children of each age group and constructing the corresponding environment that best meets these needs. Maria Montessori observed that the child moves to adulthood through a series of developmental periods which she called the Planes of Development. There are four planes of development and each period is different but is built on the foundation of the preceding one with the Montessori environment and approach tailored to meet the child’s needs at each stage. From birth to age six, the child is characterised by his or her ‘absorbent mind’, absorbing all aspects of his or her environment, language and culture. From age six to twelve, the child uses a ‘reasoning mind’ to explore the world with abstract thought and imagination. From twelve to eighteen, the adolescent has a ‘humanistic mind’ eager to understand humanity and the contribution he or she can make to society. In the last plane of development from age eighteen to twenty four, the adult explores the world with a ‘specialist mind’ taking his or her place in the world. Maria Montessori believed that if education followed the natural development of the child, then society would gradually move to a higher level of co-operation, peace and harmony.